Description: Eucalyptus oil is from the Tasmanian Blue Gum Tree; it is a tall evergreen that can grow up to 90 meters high (270 feet). The young trees have oval bluish-green leaves while the mature trees develop long, narrow, yellowish leaves, creamy-white flowers and a smooth, pale grey bark. 100% pure, natural & uncut Eucalyptus (Eucalyptus globulus) essential oil. Steam distilled from Eucalyptus leaves, from China. 1 gallon metal jug, w/ plug & metal cap. 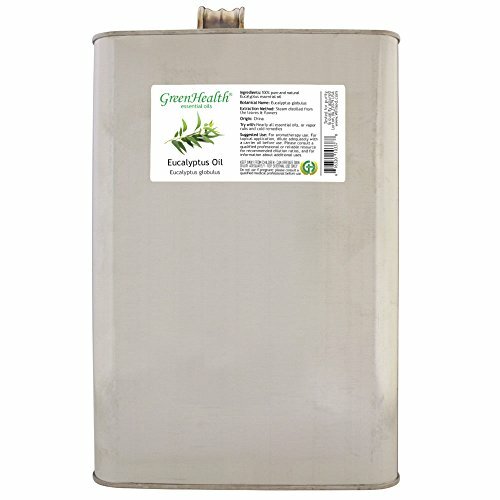 This pure essential oil can be diluted for therapeutic grade and/or other applications. Mixes well with: pharmaceutical products, from vapor rubs to cold remedies. If you have any questions about this product by Greenals, contact us by completing and submitting the form below. If you are looking for a specif part number, please include it with your message.